Home » A Small Ship Revolution? been a hot tourist stop, but now the number of cruise ships visiting has quadrupled. 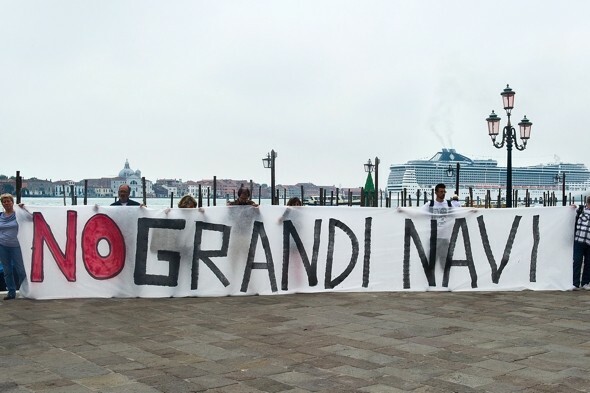 Of course, there is a Cruise Venice Committee that encourages the cruise ships to visit Venice, to support the local economy. The protestors are concerned that, while certain economic support has been felt, the ancient city is being trampled. The protestors began by blocking the road to the passenger terminal. Then they took to small boats and rafts, with signs that said, “No Big Ships” (in italian). The protestors did not say how they feel about the small ships, but the No Big Ship message is clear.